All couples planning to marry in Faith Church complete a FOCCUS (Facilitating Open Couple Communication, Understanding and Study) inventory. Couples should sign up for mentoring nine to twelve months before the wedding, so the process can be completed at least six months before the wedding. Mentor couples supplement the work of the pastor by administering the inventory and facilitating discussion. The couple getting married is encouraged by the mentors to talk to each other about issues brought up by the inventory that often would not come up until after the wedding, when they can be more difficult to deal with. The mentors are very open with the couple. They share the ups and downs of their marriage and their awareness that a strong marriage requires great effort and a reliance on God as a third person in the relationship. Couples who are seriously dating, but not engaged, may also participate in the FOCCUS mentoring program. They do not have to be church members. Faith Church now has five trained mentor couples. Faith Church occasionally conducts Sunday School classes and evening classes based on marriage. Call the church office at (920) 722-5842 or check our calendar for upcoming dates. Youth and Children's Choir - Any child from Kindergarten to 18 can be part of the choir. Practice is on Sunday mornings between our Worship service and Sunday school. Faith-Full Singers - is open to anyone. Rehearsals are Tuesday evenings at 6:30 P.M. 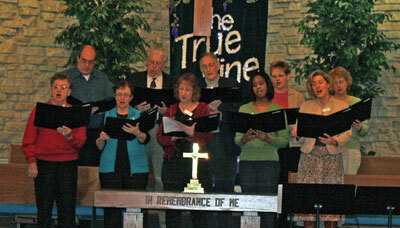 Praise Teams - there are a number of opportunities to sing or play with a praise group during Sunday morning worship. Please contact our music director at (920) 722-5842 if you are interested in any of these music ministry areas. The senior of Faith is a group of active seniors 55 or older who participate in a weekly Bible study and interesting monthly activities. The mission of this group is to promote new friendships, maintain relationships of long standing, and be a supportive body to everyone. Many lives have been enriched in many ways by involvement in Seniors of Faith Several Seniors of Faith members engage in a variety of volunteer opportunities within Faith United Methodist Church. Working together with all ages in church endeavors has strengthened our intergenerational connections. Seniors of Faith was established in 1992 and maintains a membership of approximately 25 participants. New members are always welcome to join us in our ever widening circle of friendship with one another. The seniors have traveled to Green Bay to Lambeau Field and as far southern part of the state in the Racine/Kenosha area visiting the factory for making the "Jelly Belly" Candy. The Youth Ministries programs are sponsored by fund raising events such as a car wash and brat fry, pizza sales. In the past we helped cars for a community event held in Neenah each year. The youth are always looking for other "activities" to help sponsor our youth ministry program. The Youth Ministries program is always looking for new adult volunteers to help with our youth activities Everyone is welcome to become part of our Youth ministry program.